Last fall, Mail Services, a department within Print-Copy-Mail, partnered with an ambitious team of students from Industrial and Operational Engineering to investigate how to optimize mail routes. The effort also supported the university’s ongoing sustainability initiative. After a thorough analysis, the team recommended modifications to the current routes that would reduce expenses by nearly $100,000 (fuel costs, maintenance, vehicle leases, etc.) and increase route efficiency by 12 percent. Mail Services is not only responsible for the collection and redistribution of the university’s inter-campus mail at designated locations, but also picks up departmental outgoing US Postal Service (USPS) mail to be metered, which equates to $2 million dollars annually in postage. Mail Services has a fleet of seven vehicles and each has a dedicated daily route. There are approximately 300 stops/locations on campus that are serviced five days per week. With the increased use of electronic mail and other methods of document delivery, the quantity of mail has been drastically reduced. A driver, for example, who once delivered more than 100 pieces of mail may now only deliver 10 pieces to a building. In addition, the routes are not as efficient as they once were and drivers are spending more time waiting in traffic. Part of the analysis included the students riding along with the drivers on all seven routes to gather data on volume, road conditions, and service time, among other factors. By doing so, they were able to identify opportunities that would decrease the total travel time by 19 hours per day and reduce the number of routes to five. “We are very excited and appreciate the efforts put forth by the students for this project. Not only were they able to achieve our desired outcome of increased efficiency, but they’re also extremely well prepared to succeed in their industry,” said Tom Forest, administrative manager of Print-Copy-Mail and Property Disposition. “Beyond that, their recommendations did not impact staffing levels and will further our continued efforts to provide exemplary customer service." This spring, Mail Services will be reaching out to customers with details on implementing a trial period for the newly designed routes, based on the students’ analysis. Mail Services will then solicit feedback from customers and make any necessary adjustments before implementing the new route structure on a permanent basis, which is expected to take place by the end of the year. Photo: As part of the project, students mapped out all locations Mail Services stops at daily; the colors represent the seven specific routes. 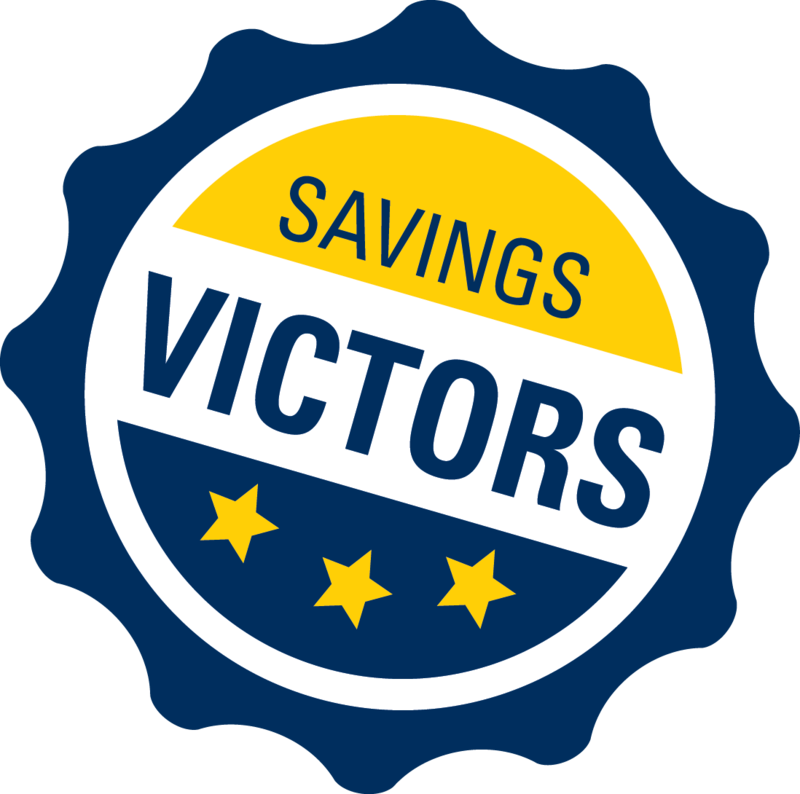 The Athletics Facilities group is the latest recipient of the quarterly Savings Victors award. The awardees include Senior Facilities Managers, Paul Dunlop, Chris Onsted, and Larry Martin as well as Joe Hepler, Supervisor of Athletic Maintenance. The group is led by Executive Senior Associate Athletic Director-Chief Operating Officer, Rob Rademacher. In 2014, Procurement Services began partnering with Athletics Facilities to conduct a review of facilities-related expenses and procurement methods used to purchase goods and services. A follow-up review of 2017 data showed a substantial reduction in expenses over a three-year period, compared to the baseline established in 2014. “During a three-year period, Athletics Facilities strengthened its budgeting and tracking processes, as well as adjusted its management team,” explained Michael Counts, strategic sourcing manager, who nominated the group for the award. “The group was also able to take advantage of potential savings opportunities based on a spend analysis we provided. The combination of these three actions resulted in an overall spend reduction by more than $1.6 million annually,” Michael said. The group was also successful in decreasing their PCard spend while increasing their percentage of spend via preferred procurement methods. Photo: The Athletics Facilities group was recently acknowledged as Savings Victors by Michael Counts, strategic sourcing manager (far left) and Amy Wang, director of procurement services (far right). The award recipients, from left to right, are Chris Onsted, Paul Dunlop, Larry Martin and Joe Hepler (not pictured). The group is led by Rod Rademacher (second from the right). To Save Money, Get Better Customer Service, and Receive Special Benefits! 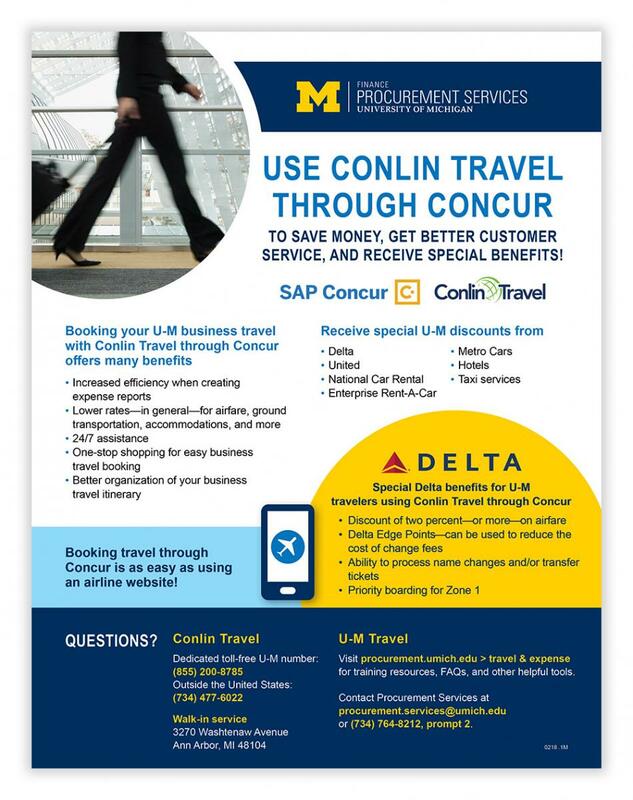 When you make your university business travel arrangements through Concur, U-M’s online travel and expense system, you’ll automatically be using Conlin Travel, the university’s designated travel agency. When you do, you’ll be able to take advantage of special discounts on airfare, accommodations, ground transportation, and more! Conlin Travel offers outstanding—and personalized—24/7 U-M customer service. Conlin Travel is based in Ann Arbor, has provided exemplary service to the U-M community since 1959, and is very familiar with the university and its traveling needs and requirements. It’s easy to get these special U-M discounts and services—just use the booking tool in Concur or book your arrangements directly with Conlin Travel. Booking travel through Concur is as easy to use as an airline website! To request copies of posters or brochures detailing this information, please email travelexpense@umich.edu. If you have unused airline tickets purchased through Concur or Conlin Travel, you may be able to save on change fees! U-M’s contracts with Delta and United Airlines allow for name changes, as well as savings on change fees, for your unused tickets. Contact Conlin Travel at 855-200-8785 for assistance with unused tickets that were booked in Concur or with Conlin Travel. Please note that Conlin Travel will review to ensure the unused ticket meets necessary requirements. When using Concur to book your university business travel, make sure your PCard details (account number and expiration date) are current in your Concur profile. Your PCard monthly limit is typically restored on the 15th of each month.In the event the 15th does not fall on a JPMorgan business day, the limit is restored on the following business day. Your PCard is not to be used for personal purchases.Doing so can result in cancellation of your PCard as well as disciplinary actions up to and including termination. Amazon Prime is considered a personal membership and is therefore considered a restricted commodity, a good or service the university prohibits from being purchased or requires a special approval prior to purchase. If Amazon Prime is paid for with a PCard, policy requires the cardholder to refund the amount of the charge to the university. Procurement Services is pleased to welcome Medline Industries as the newest supplier of medical and surgical products for the university. Founded over 100 years ago in Chicago, Medline Industries is currently the largest privately held distributor and manufacturer of medical supplies globally to organizations such as health systems, academic institutions, and laboratories. Medline Industries strongly commits to sustainability with 40 percent of its 42 distribution centers being LEED certified and 35 percent of its 50 manufacturing facilities are ISO 14001 certified. Medline Industries is also dedicated to social responsibility, having donated over $1.7 million to National Breast Cancer Foundation through its Generation Pink® exam gloves sales and the “Pink Glove Dance” campaign. Look for the Medline Industries M-Marketsite punch-out catalog to be available this spring. Additional information will also be available on the Procurement Services website in the spring. Meet Chip Reese, service and performance support manager, who began working in Procurement Services last November. Chip joined the university in 2013 and worked in ITS where he led its Operational Effectiveness Department, which included the Customer Relations, Service Delivery, Performance Excellence, and Service Management teams. Prior to coming to the university, Chip worked in a variety of positions at Henry Ford Health System for nearly 10 years. He began as a lead analyst in its Medical and Business Informatics Department, moving to technical support and project manager for hospital electronic medical record (EMR) systems in the Emergency Department and Operating Rooms for Henry Ford West Bloomfield Hospital. His final EMR implementation involved Epic, a medical records software, where he managed technology and process integration efforts. Chip will be picking up some of Michael Counts’ responsibilities. Michael, who is currently the strategic sourcing manager in Procurement Services, plans to retire in July. Chip will help lead procurement initiatives, including strategic sourcing events as well as spend analysis activities for customers on all three campuses. Chip received his undergraduate degree from Central Michigan University and an MBA from Walsh College. He lives in Superior Township with his husband Patrick, son Grayson, and a puppy is coming soon. “My son is almost 3, so spare time seems like a distant memory. After work, it seems like the majority of my time is spent as a short order cook, a remote control, or a luggage rack.” He does warn that he likes to bake, so his colleagues won’t be surprised if a lot of treats show up in the break room! He can be reached at chiprees@umich.edu or (734) 615-8762. Last month Property Disposition (PD) was featured on WEMU radio as part of its “Hidden in Plain Sight” series, which highlights people, places, and things that are making a difference in the community, yet are not widely known. The PD warehouse, located at 3241 Baxter Road, has great deals on a diverse selection of used items, including furniture and lab equipment. In FY 2017, PD’s sales were over $3 million, with at least 90 percent going back to the university units that provided the items. More information on Property Disposition. Nearly 25 caterers participated in the annual Catering Show last fall. For the first time, Procurement Services asked each supplier to minimize plates and containers and bring compostable items, resulting in a total zero waste event. An event qualifies as zero waste when 100 percent of the waste that would otherwise end up in landfills is instead taken to compost facilities. With help from the Office of Campus Sustainability (OCS), information on contaminants to avoid and what products are accepted as compostable ware were shared prior to the event and verified during the show. For the Catering Show, OCS provided all the appropriate signage and bins to collect the waste. By using only compostable items along with the food, the waste that would otherwise go to already overflowing landfills is redirected to a facility that processes and re-distributes compost material. With the help of staff from OCS, suppliers were given both background information on composting benefits and which products qualify. A common misconception is that any biodegradable items qualify as compostable and it was important that the suppliers knew the difference. While both degrade by microorganisms, it is only the compostables that break down into safe and usable soil amendments to be re-sold. Biodegradable simply means that it can be disintegrated by bacteria, fungi, or other biological means. Along with diverting almost 800 pounds of waste, this event proved to be a huge opportunity to educate suppliers on waste and green alternatives that are easily accessible. In order to ensure the event’s success, Procurement Services connected suppliers to the university’s strategic supplier, BBC Distributing, who supplies all compostable items for food service and catering. If it happened that a vendor could not provide compostables at the show, OCS was well equipped with extra supplies as back up. “The event was great! We had a lot of positive feedback from not only faculty but also the vendors themselves. It is always amazing to see a campus that supports zero waste initiatives and to see vendors supporting the cause,” said Justin Ahearne, sales consultant at BBC Consulting. “We would love to continue to expose other departments and organizations to the compostable value. I believe the best way for people to switch to compost is to see the product and talk about the variety of options available”. Procurement Services continues to promote zero waste events like the annual Catering Show whenever possible. Over 1,100 Xerox multi-function devices (MFDs) have been installed across U-M since installations began last March. The installations continue to progress across the Ann Arbor, Dearborn, and Flint campuses as well as Michigan Medicine departments. To add a new Xerox MFD or replace an existing non-Xerox MFD, please email MyNewXerox@umich.edu or call Linda Mexicotte, Xerox senior client manager, at 248-921-0205. Xerox will schedule a consultation to assess your print needs and will assist with placing your Xerox order. If you have questions about a scheduled or recent Xerox installation, or need general assistance, please email XeroxRequest@umich.edu or call 855-249-4213. To place a service or supplies order for your Xerox MFD, please contact the Xerox Help Desk at 855-249-4213 or through the Xerox Services Portal. Learn more about the university’s strategic contract with Xerox.